We saw the most beautiful movie the other day – The Maid, written and directed by Sebastian Silva. It isn’t stylistically gorgeous – it has the look of home videos from a decade or so ago – it is emotionally beautiful – full of honesty and grace and sly humor. Raquel, played by Catalina Saavedra in a remarkably precise, powerful and restrained performance – is the live-in maid for a middle class family in Chile. She’s been with them more than half of her life, their world is her world. She roams the house when everybody is gone, with vacuum and duster, but she has dominion over only a tiny portion, a cell-like bedroom that looks out onto the kitchen. She loves the family, and they love her, but with a stunted, confused sort of love that cannot express itself in real affection. She’s started to have horrible headaches and dizzy spells, so they decide to hire somebody to help her, despite her protestations. With a devastating blow of well-meaning cruelty, they give the new “girl” care of the kitchen and the food, thus taking away the source of Raquel’s comfort and power, the nexus between two worlds. This is the space where Raquel has control, where she is vitally important, the space from which she nurtures the family. When this is taken away from her, she doesn’t make life easy for the new maids, and the script cunningly plays on our expectations to suggest that we’re going to follow Raquel into a world of darkness and depravity. The manner in which these expectations are gratified or denied is a source of great film-watching joy, so I can’t say too much more without spoiling the film. I’ll just say that a few moments of exquisitely portrayed human connection, in all of its poignant confusion, happiness, and sorrow made this simple, understated tale of an ordinary woman one of the most powerful films I’ve seen in a long while. Honestly, I’ve put off writing about it all day because I can’t do it justice! I know they have empanadas in Chile, but I don’t suppose they have any like these! 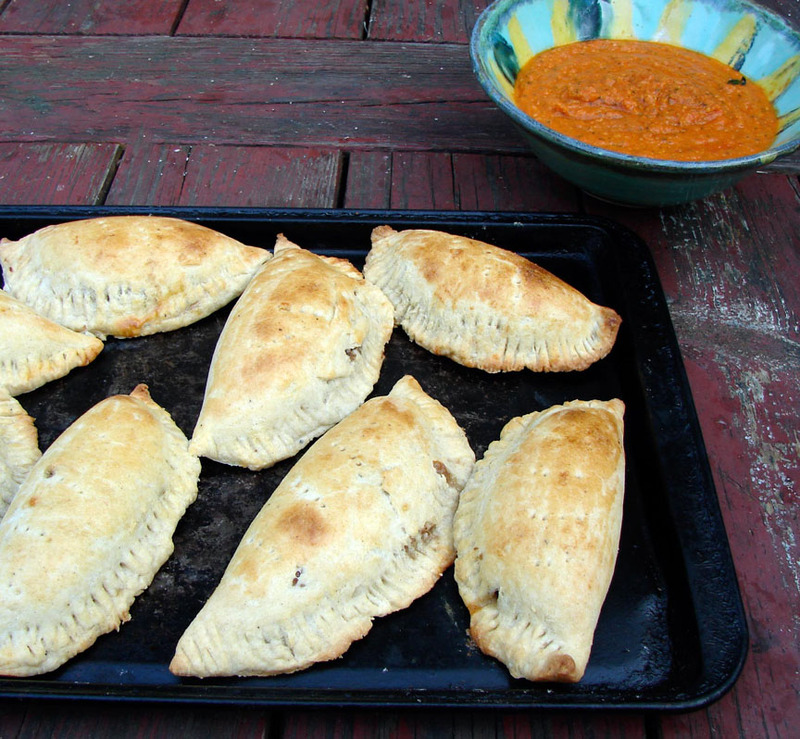 I thought of them as a sort of cross between samosas and empanadas. So they have potatoes and peas (comforting and bright!) 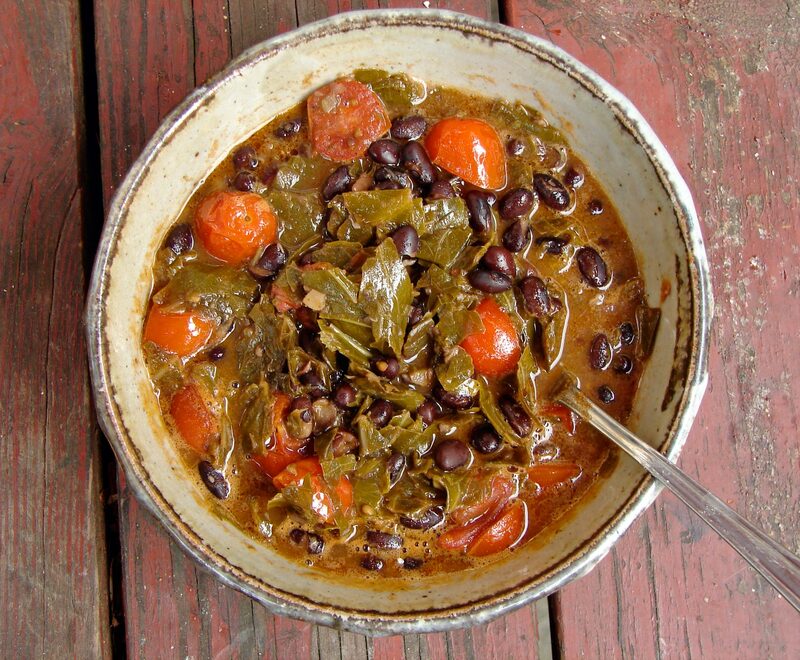 and they have smoky paprika, smoked gouda, spinach, and earthy black beans. The crunchy crust is made with masa harina, cayenne and black pepper. These were really delicious! I felt proud of them, and happy with the combination of flavors. Here’s Ayayayay by Pedro Piedra from The Maid’s soundtrack. And here’s Promesas by Los Mono, which is a video I was very taken with a few years ago. Turns out Sebastian Silva is Los Mono! Who knew?!?! We went to the Princeton art museum this week. In the downstairs rooms, they have sculptures from all over the world – from Japan, China, the Pacific Northwest, Ancient Rome, Ancient Greece, Ancient Egypt, Mayan, Incan – the room is full of spirits, pinned and labeled and living behind glass. Beautiful monsters that protect tombs, strange animals that protect the home or the harvest, odd creatures that have some function inexplicable to us today. The place is buzzing with life and mystery. My boys were very inspired! Malcolm has been drawing spirit wisps, spirit goblins and spirit angels for days. He told me that he sees spirit wisps all the time when we drive through the countryside on dark nights. They appear as flashes of blue in the trees. As I’ve said in the past, I love the idea of spirits, and I see spirits everywhere, so I’m delighted by the sight of the boys next to each other on the couch, bent over a table, scribbling furiously in little books and describing the powers that the spirits have. 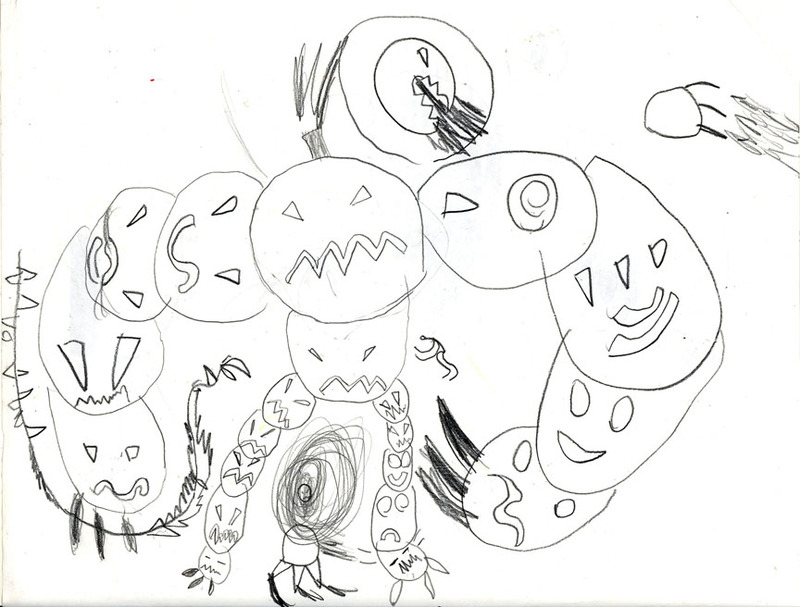 Inspired by totem poles and masks of the pacific northwest, and by the time of year, Isaac drew this pumpkin man. He’s made up of faces! Pumpkins are so perfectly suited to legend and myth. And they’re so delicious! They’re among my favorite foods. And empanadas are among my favorite foods. So together…well, it’s a perfect combination. I really loved these. 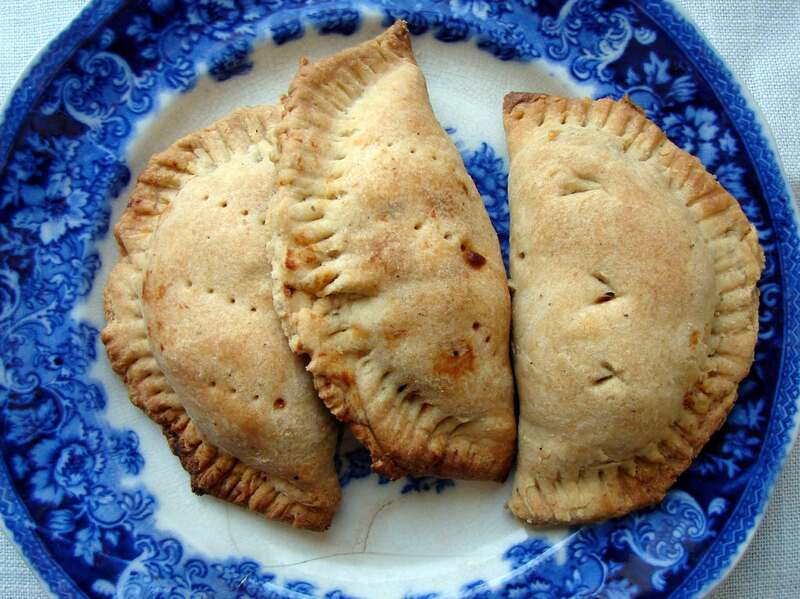 They’re seasoned with sage and sweet spices – cinnamon, nutmeg, allspice and ginger. They’re comforting with melted cheese. They’re crispy with a masa harina crust. I made a zingy tomato sauce to go with them, spicy with jalapenos, and tart with lime. Here’s Feel the Spirit by the Ethiopians. I’ve moaned many times about the death of American Independent cinema. The way I see it, the thrilling golden era of the seventies and eighties (Jarmusch! Lee! Sayles! Hartley!) gave way to an era of derivative, overblown hollywood-wannabes. American independent cinema is dead – killed off by two clever young men who made flashy little hollywood movies, and by the generation of filmmakers following them, whose knowledge of film history went back no farther than these clever young men. Independent filmmaking became an industry – the films were products, the filmmakers wanted to be stars. But the films were like fast food, at once too much and too little – insubstantial and unsatisfying. Rather than carry on with this cantankerous whinge, I’ll tell you that lately I’ve been very excited to discover that American independent cinema is alive and well – it’s just not living in North America. We’ve watched a number of films lately from Latin America that give me so much hope – engagingly human, unforgettable, and inspiring. Despite being low-budget, and not containing celebrities, each of them achieve some level of perfection of production that I find thrilling. Acting, camera work, music, writing – all carefully combine to make films that glow on the screen, and in your memory. All of the films share a quality that made them especially dear to me. They are ordinary – stories of ordinary people, of their day-to-day-life, of the food they make, their mundane jobs, but they are so beautifully presented that they become extraordinary and compelling. Like a well-made meal, the films are simple, but the ingredients are exactly as they should be, and they’re sustaining and memorable. I’ll tell you about a few! Duck Season has become one of my favorite films of all time. It’s the first feature by director Fernando Eimbcke, and it tells the story of two boys in a high-rise in Mexico. It’s Sunday, they’re stuck in their apartment, and the power is out. It’s a really ecstatic film, and we watched it twice in two days! From Brazil, we have The Year My Parents Went on Vacation, by director Cao Hamburger, about a boy who goes to stay with his grandfather and develops an unlikely friendship with his neighbor. A perfect example of how attention to every detail of production can make a simple film resonate. I’ve already mentioned Adrian Biniez’ Gigante, from Uraguay, because it inspired me to make pizza with faina! A lovely movie with an underwater glow about the lighting and the pacing. And Whisky, a disarmingly dry, touching, and funny movie from Juan Pablo Rebella and Pablo Stoll. The same directors made 25 Watts, a day in the life of three friends that’s low key, funny, thoughtful, and that you’ll think about long after you’ve seen it. One more! From Argentina, the tale of a housekeeper and her over-bearing employer – Live in Maid, by Jorge Gaggero. It’s a quiet film, but the small telling details, which examine the routines that shape these two women’s lives, make them alive for us. The film is a very human and immediate way of describing what’s happening in the larger world of politics and economics. All of these films are like little gems – it’s so wonderful to discover them. They allow you to travel to another part of the world, and give you such an intimate glimpse of the people that live there, and do so with such generosity, humor, and subtlety, that you feel fortunate to spend some with them. Your song for today is from Lake Tahoe, another remarkable movie by Fernando Eimbcke. The song is La Lloroncita by Los Parientes de Playa Vicente, and it’s gorgeous. And your meal for today is tacos made with black beans, chickpeas, yellow squash and corn. Everything is combined in a sauce of pumpkinseeds and fresh basil – a sort of pumpkinseed pesto, but lighter. 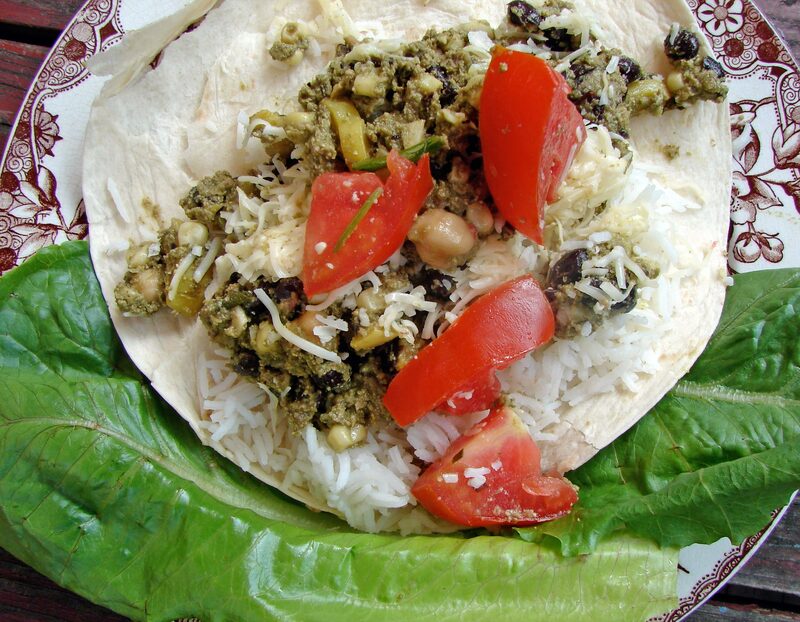 We ate it with warm tortillas, chopped tomatoes, avocado, romaine, and grated sharp cheddar. I have to admit that it’s a little funny-looking (David laughed when I brought it to the table) but look beyond that! Because it tastes very good! Sweet, savory, a little smoky, a little spicy. First we see a beautiful black and white shot of majestic mountains. Into the frame come the head and shoulders of a samurai, his back to us. He stands and looks up at the mountains for a few moments. And then he hunches his shoulders and scratches his head. He’s got fleas! We follow the back of his shaggy head as he walks, and without even seeing his face, we learn so much about him, from his posture and his gait. It’s Toshiro Mifune, baby! Surely one of the most charismatic actors of all time! As he walks, he comes across a farmer berating his son. The son wants to go off and join a gang of gamblers because, as he says, it’s better than a long life eating gruel. The film, of course, is Yojimbo, by Akira Kurosawa. It’s an action-packed film, with plenty of sword fights and intrigue, but, as with many of Kurosawa’s films, the real struggle concerns extreme poverty and deprivation. In this film, as in Seven Samurai, the inhabitants of a small rural town literally have nothing to eat but rice or millet, and they’re in danger of losing that. The samurai that fight for their lives and often to their deaths, are fighting for grain, fighting so that the son of a farmer can have a long life eating gruel. As with all of my favorite films, it’s the humanity and humor mixed with the drama that resonates. We love the samurai as much because he’s rootless, confused, and has fleas as we do because he’s charming and a brilliant swordsman. As I’ve mentioned many times, I’m a peaceful person of low ambition, and I think I could enjoy a long life eating gruel, if the gruel was as tasty as I could possibly make it! It was partially because of Kurosawa that I went out and bought some millet. I’ve made it in the past, but not very well. I wanted to try again. I used a basic technique, described by Madhur Jaffrey, of toasting and then steaming the grains. But I cooked them in broth instead of water. It turned out delicious!! Everyone in the family liked it! Soft, but fluffy and flavorful. I’m a millet fan! 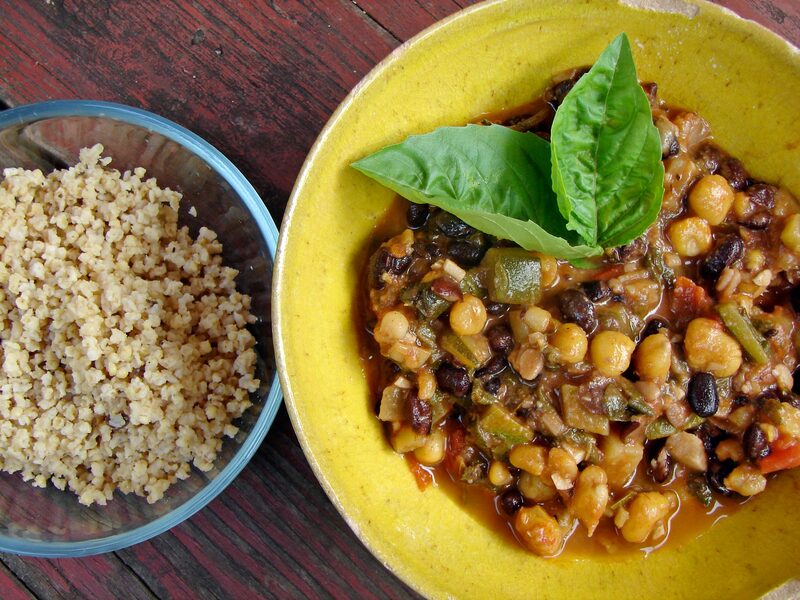 I also made a sort of summery stew of lots of vegetables mixed with black beans and golden hominy. (You could easily substitute white hominy!) You could call it CSA stew, because I used up a lot of the veg we got this week. I seasoned it with smoked paprika, sage, and chipotle, and we ate it with toasted strips of tortilla. Everybody liked everything!! One of the absolute best things about Yojimbo is the soundtrack. It reminds me of RZA’s soundtrack for Ghost Dog. (High praise indeed!!) Here’s Big Trouble, from the sound track. 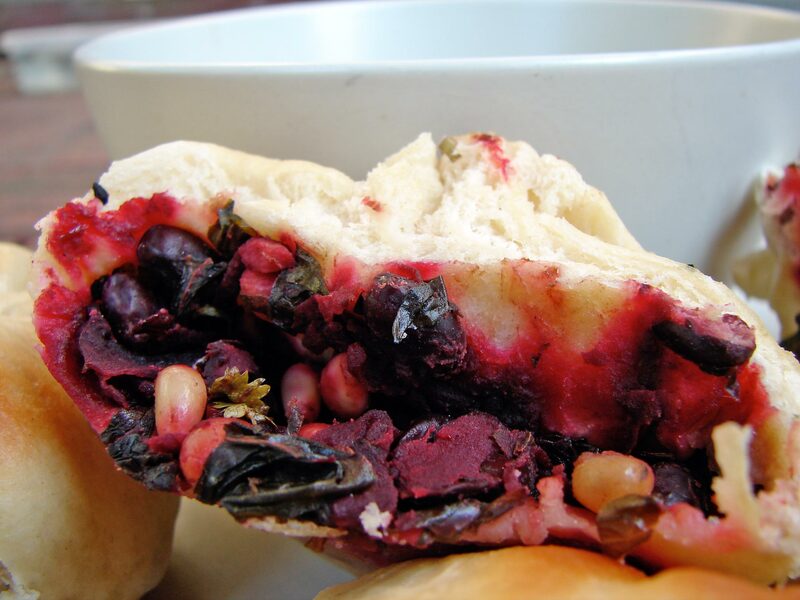 As Oscar Wilde famously said, “When a person remakes beet dumplings after having ruined the first batch by dropping the entire thing on the ground, this illustrates the triumph of hope over experience.” Well, he may not have used those exact words, but the sentiment was there. Can’t you just see him in a beet-red velvet suit? Maybe not on a day as hot as this one!! Anyway, here at The Ordinary, we believe in second chances. If, at first, you ruin your entire dinner and waste a bunch of ingredients, try try again, but this time let somebody else carry the food out to the table. That’s our motto. So David cleverly fixed the broken bamboo steamer, and we decided to spend one of the warmest days of the year standing over a steaming wok. 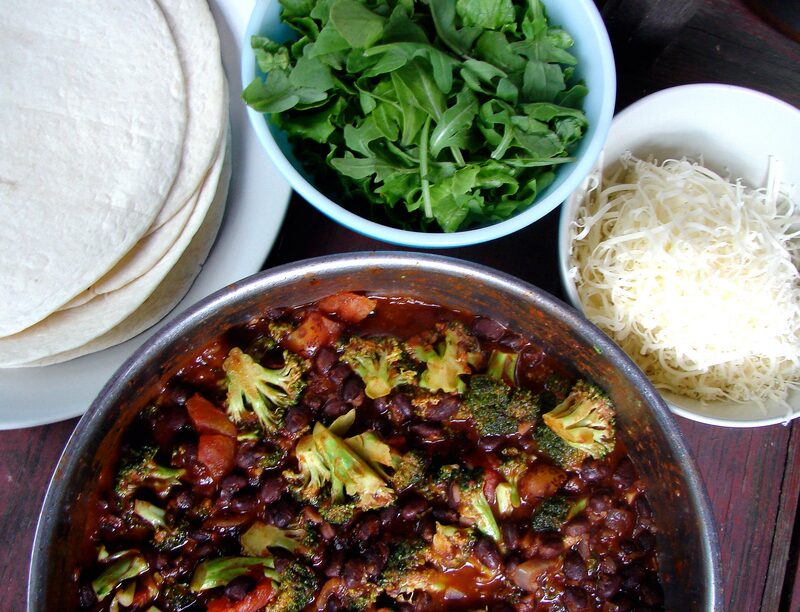 Actually – you don’t need to spend much time over the stove at all, making this. You just leave the steamer on the wok for twenty minutes, and that’s that! Ever since The Dinner of Disaster, I’ve been wanting to try the combination of beets, black beans, tamari, lime and basil. It sounded like such a nice earthy/sweet/tart/salty combination. And it seemed like it might turn out quite pretty, judging from the mess of innards we cleaned off the ground. It turned out very delicious! The dumplings are plump and juicy, pleasingly soft, but with a bit of crunch from the pine nuts. The star of the show, for the boys, was the tamari dipping sauce, which we made with balsamic, brown sugar, lime, basil and hot red pepper flakes. They’ve been eating it on everything – rice, long noodles, green peas. The dumplings were very pretty, too! Dark, rosy, and with a hint of green. 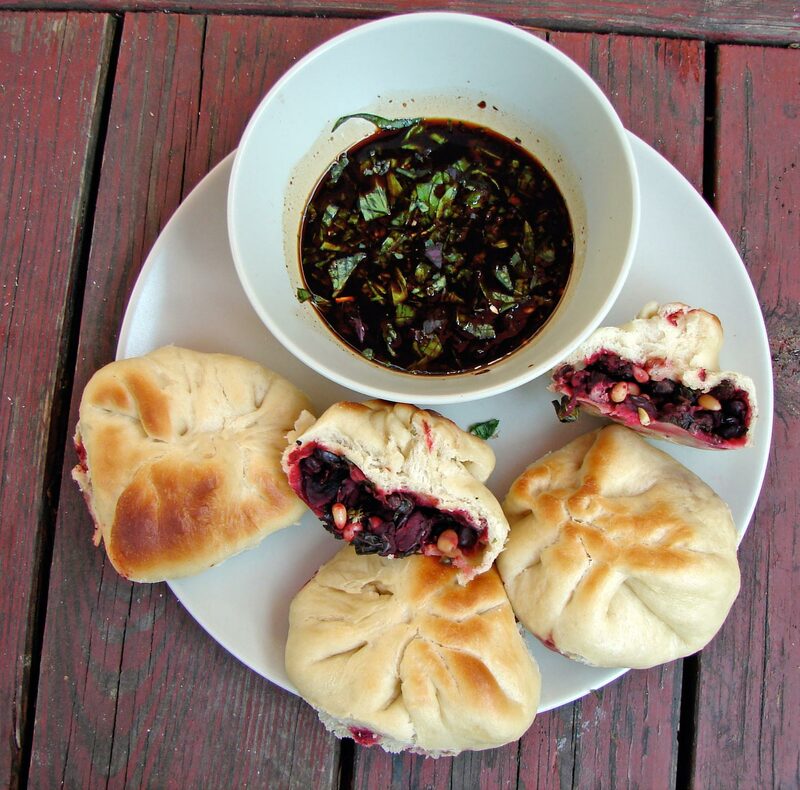 If you don’t have a steamer, you can make these in a regular vegetable steamer, of even bake them in the oven. They come out a little crisper that way. Here’s Byron Lee and the Dragonaires with Scorcher. On the last day of school, Isaac said, “Mom, for summer vacation I want to go to a big field somewhere and play tag.” And that was his whole plan! I love that idea. I love the simplicity of it. I can just picture our family, all summer long, in a big glowing green field, playing tag. I feel that I have less and less ambition to make big plans and take big trips. I’ve always had something of Moley about me. Or maybe Ratty – content to while away the hours in my riverside home. I do love to travel – just the other day I was thinking about how nice it is to walk around a strange city early in the morning. I do want to take the boys to other countries, and show them that their home is only the center of their universe. But for now, I’m happy spending long, slow summer days with the boys, not doing much of anything at all. Today we went creeking. They threw rocks in the creek, and found a spider the size of Isaac’s hand (biggest spider I have ever seen in real non-zoo life!) 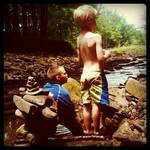 They built a pyramid of smooth creek rocks. And on the way back through the woods we found two little ponds. Malcolm waded through them, and spotted a frog. The plump bronzy-green frog swayed in the small waves made by Malcolm’s steps, his little froggy hand reaching toward the slick bank to ground himself. Malcolm made a dive for him, and he swam under a large rock. We decided to wait, as quietly as possible, for the murky water to clear, and the frog to reemerge. I’ve been trying to slow myself down, lately. I’m always impatiently on to the next thing, I can’t sit still. This is why I can’t do yoga, and I can’t enjoy sitting at the beach for hours and hours. I feel like I’m anxious to get things over with and carry on, even if I’m doing something I’m enjoying. I don’t know why. I’m always hurrying the boys from place to place like a madwoman, even though we almost never have anywhere we need to be, in the summer. So we stood very still, and listened to the wind in the trees far over our heads, and felt the warm dapply sun. You can’t hurry a frog! In that spirit, I made beans from scratch, in the slow cooker. As I’ve said in the past, I almost always use canned beans. (I’m actually very loyal to goya as a brand, and I think their beans are fresh and tasty. My first product endorsment!) But it’s fun to make beans from scratch, sometimes. It’s nice to use the slow cooker, on a hot day, because it doesn’t warm up the kitchen too much. 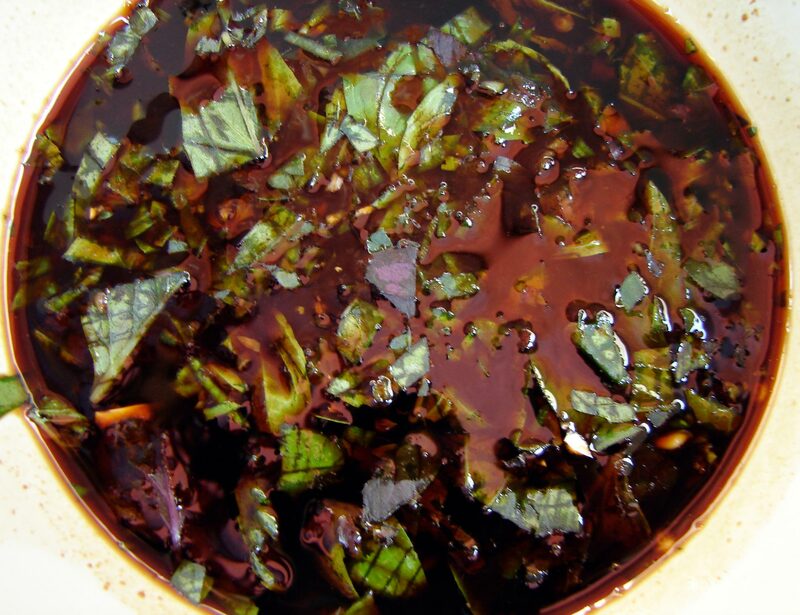 And I like collards in a slow-cooked scenario, because their flavor develops nicely and they don’t turn to mush. I’ve also been on a food-quest for black cardamom, lately, and I finally got a big bag, and I was extremely eager to try it out. They’re wonderful! Big wrinkly black pods, with the most amazing smoky-sweet flavor. I love them! Their taste is milder than their smell. If you can’t find them, you can use green cardamom, or cardamom powder, and add a touch of smoked paprika, if you have it. This would probably good with rice, but I didn’t think of that at the time! Here’s Ken Parker with Groovin in Style. I love this song so much! This is what we’ll sing while we play tag in our big glowing green field. My little Isaac has mastered the art of bicycle riding. It’s not just that he can ride a two-wheeler, but that he rides his bike exactly as a bike should be ridden. It’s all about the journey, with him. Isaac is not a practical man. He’s dreamy and glowy and delightfully meandering, and that’s how he rides his bike. He’s like a little gnat, flying along in dizzy spirals, darting unexpectedly at passersby, weaving happily from side to side. Sometimes he’ll take off at top speed for about half a block, and then he’ll stop to take off his itchy helmet for a moment, and ask me what my favorite dinosaur is, and if it has little yellow eyes. Then he’ll laugh and say, “You couldn’t know that! Nobody could know that.” Then he’ll get himself going again, and sway happily down the street. He has no sense of urgency about getting to school on time. I feel like such a traitor to the world of childhood when I hurry him along, and lecture him about lateness. I feel like the kind of person who would use the word “tardy,” I feel like I’m working for the man. Isaac is not a very practical eater, either. He seems to live on fruit and sunshine. He’s a vegetarian who doesn’t like many vegetables. He’s not hungry at mealtimes, but he’ll be ravenous fifteen minutes later. He only likes certain shapes of pasta, and swears that every pasta has its own flavor. He does eat a lot of pasta, so maybe he’s preternaturally discerning. As David said, “fifty words for snow…” When Isaac does eat something of a substantial meal-like nature, with vegetables and protein, it’s like seeing a rare and wonderful bird. I’ll point it out to David with quiet gestures, and he’ll gesture back not to disturb the exotic creature at the watering hole, or he’ll bolt, and leave his meal uneaten. Last night I decided to cook up some scallions and broccoli I’d gotten from the CSA. I was extremely tired after a ridiculously busy shift at work. This was quick, and had a nice mix of salty, hot, and sweet. Isaac approached it slowly. First he picked out the broccoli. Then the beans, one at a time, then he began to eat everything together, by the forkful. Huzzah!! I’ve been waiting to cook with scallions so I could post Booker T’s Green Onions. I worked a mothers’ day lunch shift yesterday, and I regret to say that it won. It beat me. It did me in. [Whiny rant alert!] Waitressing is really hard! You’re on your feet the whole shift (6 or 7 hours, usually for me). Literally on your feet – you don’t sit down! You don’t eat. You do drink lots of coffee, which might contribute to the post-work fatigue. You have to remember stuff! You have to be nice to people, and communicate with them in a way they understand!! And all for the princely sum of $2.13 an hour! So why do we do it? The glamor, I suppose. The prestige. Okay, whinge over. Yesterday after work I was plenty tuckered out. I was stupid tired. So I wanted to make a quick and nourishing dinner. I fell back on my old standby – the soft taco. I make some basmati rice; I warm up some flour tortillas; I grate some sharp cheddar; I chop up some lettuce. That’s all the extras. And then I make a mess of beans and vegetables. This is where the creativity comes in. I like to make something saucy and spicy. 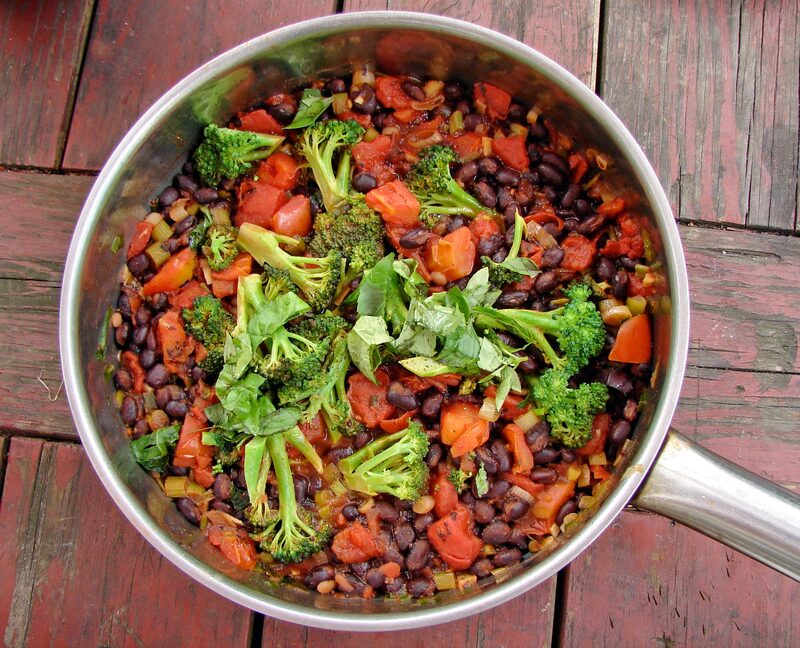 Yesterday I did this with black beans, broccoli (which has a very nice texture for the inside of a taco, I think! ), puréed roasted red pepper and tomato, chipotle, sage, oregano, cumin and smoked paprika. Easy & tasty! Here’s Fugazi with I’m So Tired. I love this song! The weather has been remarkably strange this week. People will walk up to one another and remark, “what a strange day!” We seem to go through several seasons in one day. The mornings are cool and damp and foggy. The chill stretches into the afternoon, so that you sit, shivering in your brick house (which stays cool till sometime in August) and piling on cardigans. Then, when you venture out around three o’clock, the sun burns through the haze and suddenly it feels like mid-summer. It’s hot. You feel dazed, dizzy and burnt in the unexpected sunshine. Then small showers pass by, when they’re not predicted, and a gentle thunder storms wake you at 4:30 in the morning. What strange days! Malcolm and I went for a walk yesterday morning in the seashore mistiness. Everything was vividly green through the haze. We pilfered a lambs ear from the abandoned train tracks for Malcolm to plant in the back yard. Someone passing asked Malcolm if he likes lambs ear because it’s soft. “No,” he said matter-of-factly, “Because it smells like goat’s cheese.” That’s my boy!! It’s been nice cooking weather. Lots of exciting produce – fresh and tender and new. But it’s not too hot to cook it yet, and if you’re lucky the day stays warm long enough that you can eat outside. The peanut sauce in this recipe was inspired by barbecue sauce. I find barbecue sauce fascinating. The mix of flavors. The fact that it often contains tamarind, which seems like an unexpected ingredient in a very American food. I thought a peanutty barbecue sauce would be tasty. So that’s what I made. 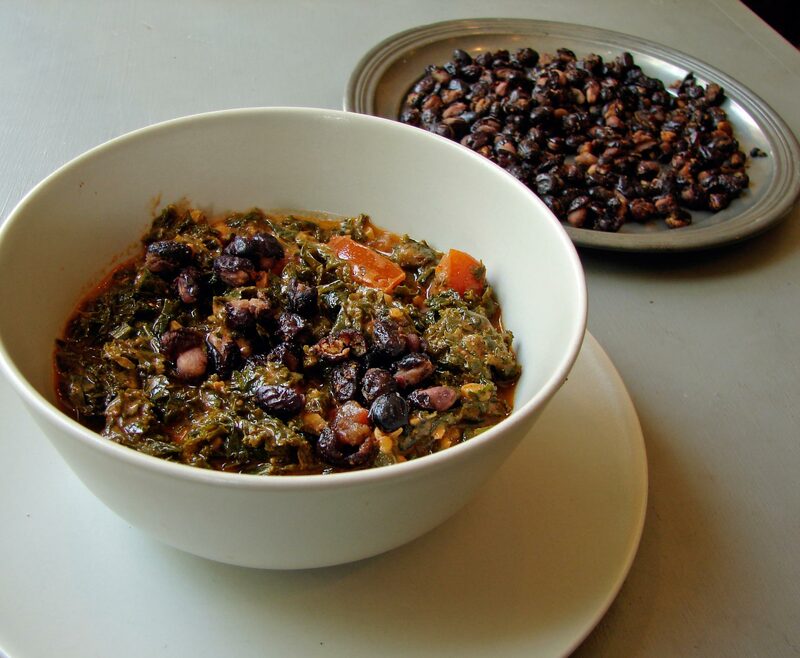 The black beans are roasted separately, with their own complementary spices. They have a nice texture, not crispy, like roasted chickpeas, but pleasantly firm. They go nicely with the kale, which brings its own assertive texture to the bowl. Here’s Beastie Boys with Peanut Butter and Jelly. I love it! I love them! There’s a special kind of joy in discovering a movie by accident. A movie you haven’t watched trailers for, or read reviews of, or looked forward to seeing. The other night we watched a Korean film called Castaway on the Moon. Knew nothing about it. What a nice surprise! A delightful mix of very human, and slightly but magically surreal. I’ll try not to give too much of the plot away, but here’s the basic story. A man jumps off of a bridge over a river in the heart of a bustling city (Seoul). He washes up on an island in the middle of the river. He might as well be in the middle of nowhere. He becomes an unlikely Robinson Crusoe. And he becomes obsessed with black bean noodles. To him they represent hope. Of course, after watching the movie, I, too became obsessed with black bean noodles. It turns out real Korean black bean noodles don’t have black beans as I know them, but a paste made of black soy beans. Too late! 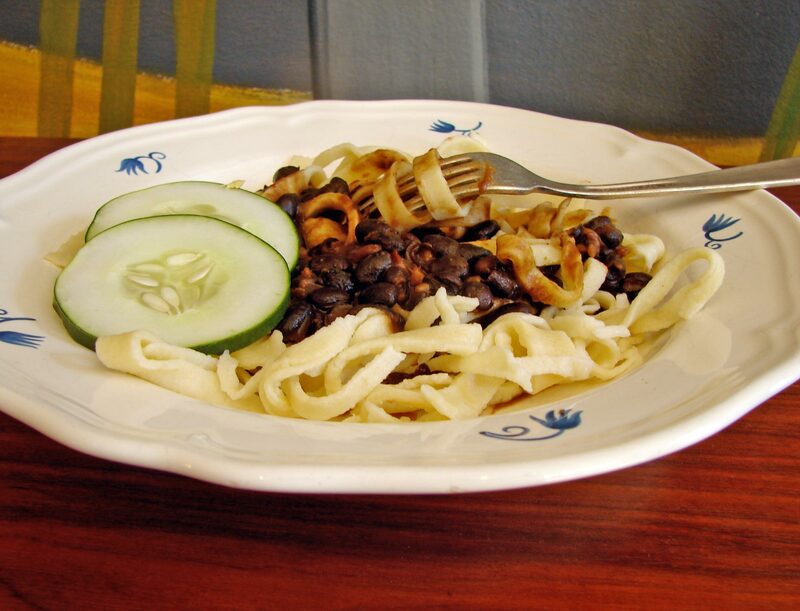 The idea of black beans and noodles was firmly implanted in my head. It seems they sometimes add meat or seafood to the black bean noodles, so I thought of my black beans in that capacity. Apparently the soy bean paste is mixed with caramel. So I made a sort of caramelized soy sauce with tamari and raw sugar. Malcolm, who is a big fan of noodles with tamari, helped me pick the spicy spices. We decided on garlic, ginger, basil, red pepper flakes and scallions. Delicious! Black beans and tamari are wonderful together. Why didn’t I think of it sooner? We didn’t go to all the trouble that the man in the movie did, to make the noodles, but we did make them ourselves. It turned out to be very easy and very very fun. Not as easy as opening a cardboard box of dried noodles, but much more delicious. We’ll be making more noodles, soon. And different shapes, too. Watch out! Here’s Culture’s beautiful I’m Alone in the Wilderness.